Rashtriya Chemicals and Fertilizers Ltd (RCF Ltd), Is Appointing Eligible People To The Post Of Boiler Operator. So Interested People Can Apply For This Job Through Online Mode, Within The Given Time Period. Boiler Operator Grade III(A5)→16 Vacancies, Kindly Go Through The Image's Below For Eligibility Criteria And More. B. 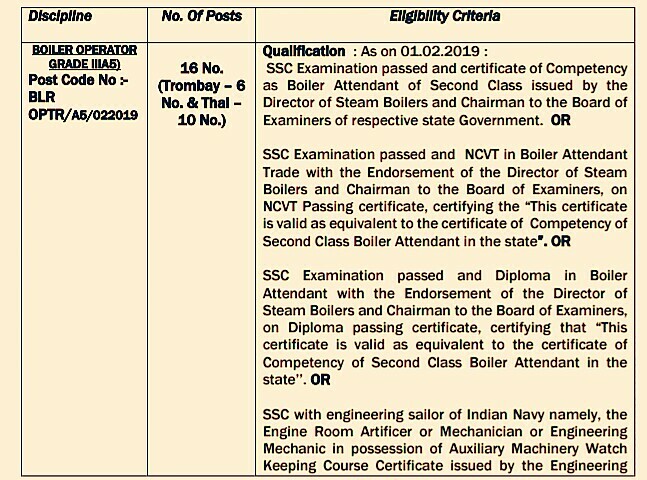 Eligible Criteria For Boiler Operator Vacancy In RCF Recruitment 2019. Age Limit →30 Years As On 1st Of February, 2019. Mode Of Examination/Selection Process →Written/OnlineTest /MedicalMedicatEs. Online Application/Examination Fee→₹500 For Unreserved Candidates & No Fee For Other Reserved Candidates. Now Apply For Boiler Operators Job Vacancy In RCF Recruitment 2019.